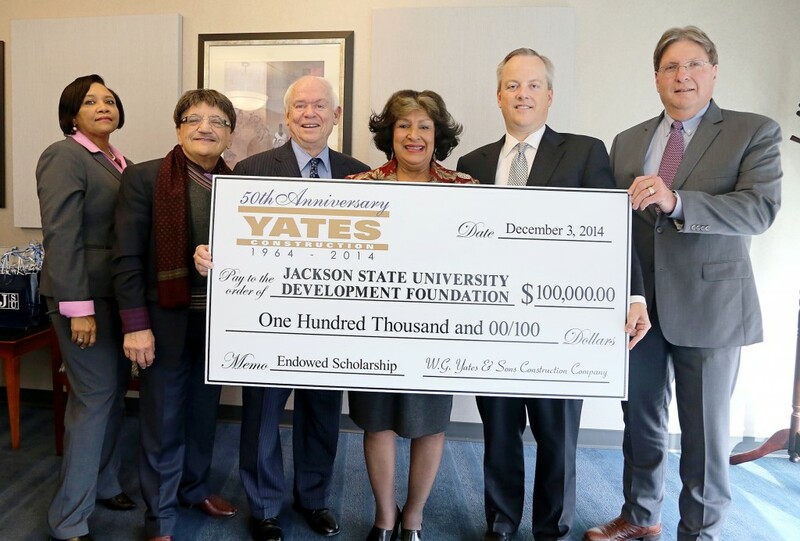 Jackson State University President Carolyn W. Meyers (center) beams after executives from Yates Construction presented a gift to help establish an enduring partnership with the 50-year-old company. They envision an opportunity to create internships and future employment for graduates. Joining Meyers (from left) are: Constance Lawson, JSU development officer; Dr. Richard Alo, dean of the JSU College of Science Engineering and Technology; W.G. “Bill” Yates, chairman of Yates Construction; William Yates, president of Yates Construction; and Paul Musick, vice president of Yates Construction. (JSU photo by Charles Smith). Yates Construction presented a gift to JSU President Dr. Carolyn W. Meyers on Wednesday in the JSU Student Center on the main campus as a gesture of goodwill and to foster a relationship with the institution, whose CSET and business programs have garnered national acclaim and research funding. Meyers hailed the remarkable moment as an opportunity to prepare students for the global workforce. She says the partnership will benefit students by creating internships and opportunities for the future employment of students with the company. In addition, company executives say one of their primary objectives is to diversify the company by recruiting and hiring talented graduates and expressed that Wednesday’s gift is only the first step in their future collaboration. JSU and Yates officials say they hope the efforts forged by this partnership will create an enduring relationship that will enrich both institutions and allow them to continue in pivotal roles by shaping the community and economic climate of the city and state. Celebrating its 50th anniversary this year, Yates is a $2 billion company with more than 10,000 employees throughout the southeast. The Philadelphia, Miss., based organization in the seat of Neshoba County expanded into Jackson in 1989. Following the check presentation, company executives, including Yates Vice President Paul Musick, accompanied Meyers on a campus tour that included the CREATE Center and the College of Engineering building.